The Sonoran Desert . .. .... . The Sonoran Desert is an arid region covering 120,000 square miles in southwestern Arizona and southeastern California, as well as most of Baja California and the western half of the state of Sonora, Mexico. Subdivisions of this hot, dry region include the Colorado and Yuma deserts. Irrigation has produced many fertile agricultural areas, including the Coachella and Imperial valleys of California. Warm winters attract tourists to Sonora Desert resorts in Palm Springs, California, and Tucson and Phoenix, Arizona. This is the hottest of our North American deserts, but a distinctly bimodal rainfall pattern produces a high biological diversity. Winter storms from the Pacific nourish many West Coast annuals such as poppies and lupines, while well-developed summer monsoons host both annuals and woody plants originating from the south. Freezing conditions can be expected for a few nights in winter. Trees are usually well developed on the desert ranges and their bajadas. Often abundant on these well-drained soils are Little-leaf Palo Verdes, Desert Ironwoods, Catclaw and Saguaro. The understory consists of three, four or even five layers of smaller woody shrubs. 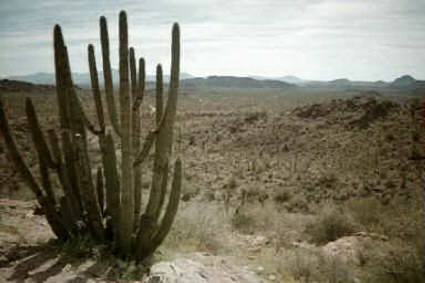 Tall chollas may occur in an almost bewildering array of species. The alluvial lowlands host communities of Desert Saltbush, wolfberry and bursage. On coarser soils, Creosote Bush and bursage communities may stretch for miles. Where the water table is high, Honey or Velvet Mesquite may form dense bosques or woodlands. Other species are restricted to alkaline areas. Stream sides may be lined with riparian woodlands composed of Arizona Ash, Arizona Black Walnut, Fremont Cottonwood and various willows, with a dense understory of Arrow-weed, Seepwillow and Carrizo. The Sonora Desert is rich in animal life as well, with many species in all groups derived from tropical and subtropical regions. The western part of the Sonora Desert (sometimes called the "Colorado Desert") is closer to the source of Pacific storms and is noted for spectacular spring flowering of ephemerals when there is winter-spring rainfall. (This phenomenon is not limited to here.) However, the western portion is relatively depauperate, lacking many of the species such as the Saguaro that depend on good summer rainfall. Approximate Desert Boundaries: Bordered on the west by Borrego Springs, and San Gorgonio Pass in southern California, on the north by Interstate 10 in California and Interstate 40 in Arizona, on the east by Arizona's U.S. Route 191, south to the tip of Baja California, Mexico.